A series of public events open to the public will explore APEC themes and policy issues relevant to Papua New Guinea and the Pacific. The first event was held on 24 May 2018 and featured addresses by Foreign Minister Rimbink Pato; Australia’s Assistant Minister for Trade, Tourism and Investment Mark Coulton; and World Trade Organization (WTO) Director-General Roberto Azevêdo. Discussions were focused on trade and the rules-based global trading system. WTO Director-General Roberto Azevêdo takes a question from the audience. World Trade Organization Director Roberto Azevêdo highlighted Papua New Guinea’s importance to the international trade system, and the importance of international trade in addressing issues faced in PNG, including recovery from natural disasters. Mr Azevedo said that rigorous studies suggest that the frequency and severity of natural disasters are likely to increase, and WTO members have started a dialogue on how trade policies and practices can help in dealing with natural disasters. “The right policy can boost recovery by helping to improve supply-side capacity and restoring trade after a disaster. We have to get this right and contribute in any way we can,” he said. Minister Pato said that the WTO continues to be a major contributor to increased levels of global prosperity. He further stated that the message Papua New Guinea wants to send as APEC host is that the world will be all the better for a steady, free, fair, inclusive, rules-based trading system. The event also included a panel discussion with Dr Allan Bollard, Executive Director for the APEC Secretariat based in Singapore. Dr Allan Bollard, reiterated APEC’s focus on ensuring there are good rules for international trade that will translate to improvements in living standards. “Over the time that Papua New Guinea has been in APEC, since 1993, income per capita has doubled – you are roughly twice as well off as your parents. We want more of it and that’s been the story right around the APEC region – leading the world in terms of trade given growth,” he said. 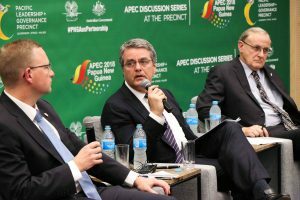 Australia’s Assistant Minister for Trade, Tourism and Investment Mark Coulton also spoke at the first APEC discussion series, and said Australia strongly supports Papua New Guinea’s growing economic integration and leadership role in the Asia-Pacific region. The APEC Discussion Series at the Precinct is being held at the University of Papua New Guinea throughout 2018 hosted by the PNG APEC Secretariat and the Pacific Leadership and Governance Precinct, supported by the PNG – Australia Partnership.